It’s time for another Non-Consumer Mish-Mash, where I write a little bit about this and a little bit about that. Remember Ken Ilgunas? The man who lived in his van while attending graduate school and wrote about it in Walden on Wheels? Well Ken is making news again with a recent NY Times op ed piece about living in a Nebraskan house which he keeps at a brisk 45º. I keep my house at 63º during the day and 57º at night, which works great for my family. Of course if like Ilgunas I were single and childless, I’d probably keep it lower. He’s trying to minimize the amount of coal required for his physical comfort, which is hard to argue with. If every American were willing to put on an extra layer instead of setting their winter thermostats at 72º, we could do a lot less blasting of beautiful West Virginian mountaintops. Click HERE to read his NY Times piece. My husband and younger son drove down to southern Oregon for a soccer tournament this weekend, which left my older son and I without a car. This was a non issue as I’m still recovering from being sick and my son was straight up sick. (So you know, not likely to leave the house much anyway.) I did walk to the library to pick up a movie I’d put on hold and stopped in at the grocery store on my way home for sale milk, free yogurt and garlic. The Portland weather was unusually warm, so I turned off the furnace for the entire weekend. I scrubbed down my kitchen floor using a bucket of mildly soapy water. Who needs expensive and toxic cleaning products? I didn’t feel like going to the store for bread yesterday, so I baked three loaves of whole wheat bread for sandwiches. I’d forgotten how easy that is. I cooked up a large amount of small white navy beans for a recipe in my crock pot. It was tremendously more than I needed, so I froze the extra in mason jars. They will be easy to defrost as needed and frugal as can be! Umm . . . apparently not. 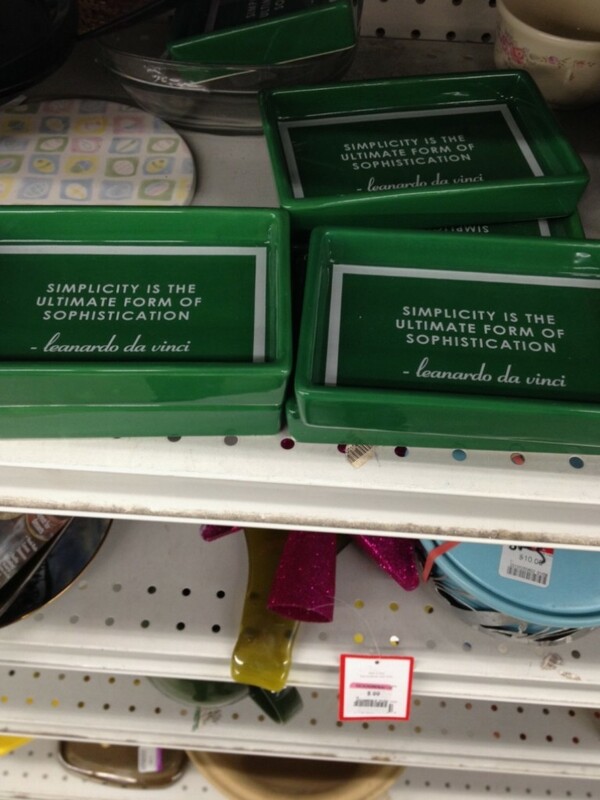 Just because you stamp a saying on a made-in-China knick-knack doesn’t mean it has anything to do with simplicity. Or Sophistication. Or ashtrays. If my grandmother had seen this on my coffee table, she definitely would have used it to stub out her cigarette. Her simple and sophisticated cigarette. Trying to think if those could possibly be something other than ashtrays! Soap trays? Could be cute in a green-accented bathroom! 45 degrees? I’ve read some places say you need 60 to stop your pipes from freezing (but I think that’s silly). He addresses that, and it’s 45 degrees. Not if you live in interior Alaska, where it is 44 below zero today, no wind chill but actual temperature. I can’t even imagine what that feels like. I couldn’t find where he gives the reasoning for 45 degrees, other than it just being the lowest his thermostat could go. It makes sense because it’s above freezing. I’d like to be able to drop my thermostat that low when I leave my house to go on vacation, but I definitely don’t want to come home to a flooded basement. I’ll keep looking! it depends a lot on your specific house, pipes, and exterior temperature. Trailer houses, the pipes are usually under the floor and completely exposed (because there’s no foundation) so they’re really vulnerable. My 100+ year old house, the pipes are on a barely-insulated north wall with a closed cupboard door between them and the warm house (opening the cupboard door on very cold nights makes the pipes safe but the house less efficient). Insulating the pipes themselves helped a lot. Many newer buildings, the pipes are near the center of the house and will probably be at whatever temperature your thermostat is set to even on a very cold night. So there’s no real universal rule. Brrr! 63 and 57 seem cold to me, but I do keep it at 64 during the day when it is just me and add an extra layer. We crank it up to 68 for bathing and dressing. My mother won’t visit us in the winter. I think she keeps her home around 75! So wasteful! I have to wear my summer clothes when we visit. My husband REFUSES to put warm clothes on in the winter! He likes the house at 72-74 most days (we let it get down to 55 at night & during the workday). I, on the other hand, am usually doing tasks around the house that warm me up. Its a constant battle, as I’d rather have it set to 68, especially now that I am pregnant and producing more body heat than other winters. Its so frustrating! I did read the Cold House article without realizing it was the written by the author of Walden on Wheels. Both are excellent reads. My family hates cold so we keep the house at 63 at night, 69 early in the morning and in the evening, and at 65 during the day. I vote for more layers (and we do have a smallish house but I am out voted. I made biscuits yesterday for the first time in years. They contain both yeast and baking powder and baking soda. They were excellent with leftover beef stew. Another snowy day so my Monday volunteer gig was cancelled. There wasn’t much snow so I was able to walk to a yoga class (I now pay by the month so this was a bonus class for me). I am working on taxes. We still need some documents but I’m trying to put everything together and get a feel for how we’ll make out. I didn’t buy much of anything over the weekend, just a bit of sale produce. I hope you are fully recovered soon Katy!!! As it is a blizzard out the window here in CT, and I read your note about the navy beans, I recall Ma Ingalls’ frugal ways in the book “The Long Winter,” when the first blizzard hits their South Dakota claim shanty. The family gathers around the cookstove, while a big pan of bean soup simmers on it. Ma skims off the broth for their lunch, with bread. Then she mixes the beans in the pan with seasonings, sticks it in the oven, and they have baked beans for supper. MMmmmm. The guy who keeps the temp at 45 degrees—that cannot be healthy over the long run. We use half wood stove, half oil to heat our home, and through my husband’s hard work cutting, stacking and feeding the woodstove, we keep it at a nice 67 degrees in the main rooms. But its a lot of work. Thanks, Hubby! Also, about that da Vinci quote: Not only does the ashtray misspell his name (good spot, Diane), but I Googled it and have found a couple of websites (e.g., quora.com) expressing the opinion that the quote isn’t even da Vinci’s. Monica – I love ‘The Long Winter too. When you say that keeping the house at 45 degrees long term, consider how cold the Ingalls family must have been, with no high tech fabric, especially in the latter part of winter when they were heating with sticks of hay, and didnt have enough to eat. I bet we can take much more than we do. My mom keeps it at about 75 too. I feel bad for her, because the poor lady is on blood thinners. I tease her and say she doesn’t have blood, she has red Kool-Aid. She trembles so that it takes both me and my sister to help her out of the tub in the winter. I have my apartment set for 68 in the evening and 60 overnight and during the workday. I bundle up with long underwear and a puffy vest, but I’m still cold if I’m sitting at the computer or reading. There’s no way I could do 45, but kuddos to him! I keep the house at 60 at night and 65 in the day. We have an abundance of throws (I knit) so when we sit, we snuggle. I have the crud, too, so my frugal thing was not going out for 2 days. It’s amazing how much money we spend out and about. I am a diet Dr. Pepper fiend, so my car automatically turns into a fast food place whenever it sees one. Dang! I cannot control it. The only thing I have accomplished is laundry. The mass-producers of the tchochkes spelled Leonardo da Vinci’s name wrong, too. Good eye, I hadn’t even noticed that! OMG, great catch, Diane … making the tchotchkes even more revolting! I always feel guilty when I read about the low people keep their heating. I am cold…all winter long. I start wearing 2 pairs of hand knit woolen socks in November. I wear an undershirt a sweater and another sweater, I wear fingerless mitts. I wrap myself in a wool blanket when I’m reading or watching TV. Our house is kept at 72 during the day and 69 at night. In the summer though my husband and I disagree about turning on the A/C unit, then I remember how he tolerates a warm house in the winter. We are the same, about 69 at night and 72 during the day, I’m freezing if I get up before the heat switches to 72 in the morning! November through February are really our only heavy months of using the heat and we have natural gas and the bills are reasonable, much better than the AC bills! We keep our WI home at 50 at night and 60 during the day when i am at home. Morning from 5 to 7 am we crank it to 65 just to get people moving. We have a small space heater in the bathroom for shower time. Honestly my kids still wear shorts and no socks even at 60 degrees. I often wear a tank top and shorts when i am home cleaning. And I have the heat blocked in our bedroom and sleep with the window open. Thank you hot flashes. I’m in Florida and I can’t keep the thermostat that low. The wet cold of North Florida creeps in and settles in our bones! While we have a lot of mild days, I’ve seen it dip to 7 degrees and it’s not at all uncommon to be below freezing at night. We set the downstairs unit on 69. The upstairs unit is turned to about 65, though. We use a low wattage space heater for a few minutes to warm the bathroom upstairs for showers. I work with a man who grew up in northern Maine. He said the coldest he ever was, was when his college music band was hosted (in east Maine) by local folks in their homes, and the man who hosted him kept his house at 45 deg. My co-worker said he froze all weekend long, even wearing all of his clothes. I can’t imagine living that way. I have to add that my husband has poor circulation in his hands and feet, and what is cool to me can be miserable to him. He wears gloves indoors a lot, and is never, ever barefoot, even in summer. I wouldn’t feel right making him even colder. I’m in Florida too (Central FL) and so far this past week I haven’t turn the heat on, even with the cold spells we’ve been having (high 30s and 40s at night). It was 60 in the house this morning and 63 right now and my hands are like ice. But we’ve been using sweaters and socks and extra blankets on the couches and beds and we’re fine… and have fewer headaches than when the heat is on (even though we have it set for 67 when it is on). I’ve been sitting for a while and I’m quite cold now so I’m about to go do my ironing, that’ll warm me up! Hubby also gets really cold feet so I bought him 100% wool socks, which seem to help. They can be hard to find here in Florida though. You have to buy them when it’s still in the 80s-90s, around September/October. Target and sometimes Kohls carry them. We kept the heat off this fall until we couldn’t take it anymore; the house was in the 50’s when we got up. We had 31 last night and have seen 20’s more than once this winter. The cold month here is usually February — about five years ago we had 10 days in a row in Feb. in which the temperature never got above 32 degrees F. Our little pocket of sand is colder than the area north of us, even. I’ve thought about trying to get wool socks — the husband says he doesn’t think he’ll be able to wear them, but maybe over a thin pair of cotton socks he could wear them. I’ll keep Kohl’s and Target in mind, thanks. It seems to me that those who have steady cold weather can take cooler temps inside better than I can. Maybe it’s because Floridians never get acclimated to the cold? It’ll be cold two days and balmy the next four. Well… i don’t get this 45 Farenheit thing… when it gets to the point where you have to pill on everything you own just not to freeze to death…. nope, sorry, my line is drawned . 3. Will sell some dvds soon. Won’t make much on it, but better than nothing. I am always amazed how people can keep their houses so cold. My husband and my mother when she visits require it warmer due to medical conditions. We tried 65, but finally decided 68 worked for us. As we live in a large old house with the original radiators we have our temp set at 68 all day long. We tried a programable thermostat but because I have an old boiler furnace and the radiators it was costing a fortune dropping down in temp and then trying to raise it again while we froze in the process. We saved over a third by keeping it set at 68 full time. I wonder how Katy gets free anything from the grocery store? The yogurt? Fred Meyer does a thing where you can load one specific free item onto your loyalty card each week. It’s like a yogurt or a protein bar, and you have a couple of weeks before it express, so I try to remember to do it. If you combine sales with manufacturer and store coupons and possibly even a rebate, you can get free groceries or personal care items. I personally get freebies like that most weeks. If you’re interested you can follow blogs such as IHeartPublix, TotallyTarget, SouthernSavers and more, the bloggers do all the work often even link to the printable coupons. Also use rebate apps like SavingStar (a freebie every weekend), Checkout 51, Snap by Groupon, Ibotta… you just need to upload your receipt (very easy to do) and they credit your account after they verify your purchase. Once you reach a certain amount (depending on the app), you can request a payout, which is usually a check or a credit to Paypal. Checkout 51 for instance, offers a $0.25 rebate on several produce items every week (you have to pick just one though) so if you pick bananas, for instance, in most cases you can get a free banana. It won’t go a long way for a family but if you’re single, hey, that’s a free banana! Could those ashtrays possibly be business card holders? I was thinking of those change trays that smaller stores used to have on their counters. I grew up in cold in MA in the 50s and we wore sweatshirts, hats and mittens while we did homework because my room was upstairs in the back and COLD with just one sputtering radiator. Nowadays, in my older years, I really dislike cold and have to keep my home at a decent temperature when we do have winter weather. Today, however, it is going to be 75 and I will be in heaven! I’m glad you’re feeling better, Katy. Have you tried the Bread in 5 Minutes a Day recipe? I usually keep a bowl of bread dough in my fridge, and make it up for dinner a couple of times a week. Quick, easy, cheap — my favorite. My thermostat in winter (in Wisconsin) stayed at 45 degrees for 3 years. I had no choice. Three years of no job, no unemployment and dwindling savings made me rely completely on energy assistance. I wore layers, found things to do that kept me moving, and used a space heater in the bathroom when showering. None of my pipes froze and I never got sick. These days, even though I now have a decent job, the thermostat stays low – around 50-55. Anything higher than 55 and I feel overly warm. I usually wear warm-up pants, a sweatshirt, a hoodie, cotton socks, and a pair of croc-style clogs and I am fine. If I feel chilly, I will find something to do that requires movement, like vacuuming or even walking in place for awhile. Seeing various people have been asking about the frost protect temperature. Some years ago I used to work for a company who made heating controllers for commercial and industrial buildings. The main aim of these systems was to save money, so all the default temperatures were as low as possible (for either legal or safety reasons). The frost protect level was 8ºC (which is about 46ºF). When the temperature in the building reached that level the heating came on whatever time of day it was. This was for unoccupied offices, for instance at night, so is probably a sensible minimum. Personally I keep the thermostat at 21ºC (about 71ºF) while we’re awake and we turn the heating off at night. But we are in the southwest of England so we very rarely get outdoor temperatures below freezing for any length of time. We keep our house around 62 at night and when we aren’t home, but in the morning and evening, it is set to 64-65. We use programmable thermostats and wear extra clothes if we get cold. The only time I might turn it up more is if someone is sick or something and has the chills. If the weather is super-cold outside, we actually have to turn it down or it just can’t keep up (old house, old windows, old unit). Brrrrrr. No 45 degree house for us. We’re both over 65, with an elderly chihuahua who hates cold, rain, and snow, and an 12-year-old cat. We live in a 70’s house with practically no insulation in the outside walls, but we did insulate the heck out of the attic and replaced the furnace and thermostat last year. Even though the thermostat sits at 70, the thermometer we hung on the interior of an outside wall reads about 65 most of the time. Fortunately, the house seems able to hold that temperature without the furnace coming on too frequently. It’s still less expensive than before we insulated the attic and replaced the furnace. We dress in layers and cope. We have a 105 year old house (or thereabouts) and a boiler with radiators. We keep the temperature at 68–that is warm enough to be comfortable if we keep moving but when we sit down to read or watch TV, we put more clothes on or use throws, or both. Depends on the wind–oh, and we’re both over 70. But we normally wear sweatshirt type tops and jeans and socks. The bedrooms stay a little cooler (65 when I got up this morning) because there is no thermostat on the second floor for some unknown reason. We do have one electric heater we can use in cold spots when necessary, but it doesn’t go on very often. This seems reasonable to us and so far we can still afford the oil! (Last year was a trial—$800 for a fill up for the oil tank. Prices are better this year–nothing over $600 yet. We’re about 30 miles from snowy Buffalo, NY, which does goet some snow and cold weather. Hi I happened upon your blog while reading about handwritten letters and came across the Week 13 update about a letter to your friend Sarah and just wanted to let you know that I like your saying “Use it up. Wear it out. 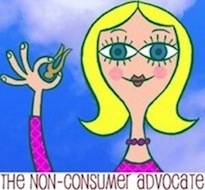 Make it Do or Do without.” — it really sums up how one can best be frugal. Have a wonderful day. The lowest my husband will go is 69 degrees. I tried 68 and he set it up to 70. I set it back down a degree and he left it alone. I don’t mind. We’re both getting older and have issues with arthritis. The colder it is the more painful our joints are when we’re sitting still – even with layered clothing on. 1. I’ve been remembering to bring my lunch more often. 2. I bought 4 DVDs, 3 pairs of stretchy pants and 1 pair of flannel PJ bottoms for my granddaughter at Goodwill today. Her 8th birthday is Friday. 3. I bought one of those motorized play cars at Goodwill today for $18. I’ll have to buy a 12 volt battery for it, but that should be less than $100 and those things are over $300 brand new. My granddaughters have wanted one for the past few years, but we couldn’t afford one. All the Goodwill stuff cost me a total of $38. Wednesday is Senior Discount day. Yay!! 4. I cooked a chicken in the crockpot on Sunday and bagged up the leftovers. I plan to use those tonight to make Chicken nachos for dinner. 5. A coworker wanted me to try a bottled smoothie he likes. I told him it wasn’t in my budget this week. He offered to buy it for me, since I’d bought a drink for him at some point in the past. I took him up on the offer and we had a very nice walk on Campus Corner, since the weather is in the 70s today. I hope you and your son are feeling better soon, Katy! I was just thinking that I am going to try baking my own bread. Cheaper (generally we pay$2-$2.50 per loaf!) and fresher! 45 degrees is too cold for me! I am happy to have the house in the low sixties (I am in my own personal summer), but my hubby and 90 year old mother aren’t comfortable. My first year being married my wife and I decided that we would cut corners by setting the thermostat at 67 and make good use of blankets. However, now that I am a little bit older and have lived through a really cold winter I have decided that it is better to spend a little extra and be comfortable at home. I still turn my furnace down while at work, but I always turn it back up when I get home.